When you're wondering if you need winter tires for driving in Amherst, the team at Virginia Select Auto will be ready to answer any of your questions. Having two sets of tires for your car or truck, one for slick winter conditions and one for warm and dry summer conditions, can improve the driving performance of your car. All-weather tires are designed to work well in many conditions ranging from hot and sunny to wintery. 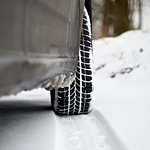 When you need extra traction for driving in deep winter conditions, the softer rubber and deeper tread on winter tires will help you maintain control. This rubber wears down quickly in the summer, making it important to swap them out when the seasons change. Our goal is to take the stress out of changing the tires on your car or truck in the spring and fall. We'll help you select the right tires for your vehicle.